The buildings that make up the Extraordinary Chambers in the Courts of Cambodia, as the Khmer Rouge tribunal is officially known, are situated in something of a suburban desert. Staff and visitors have to drive way out past the airport to a district that was not even part of Phnom Penh until the city boundaries were specially re-drawn a couple of months ago. As a result, lunchtime options are few and far between, and the staff canteen is an important amenity. It has also become an emblem of the problems which have plagued the courts, caused divisions between local and international staff, and threatened to derail the entire process. At first the concession to operate the canteen was held by a cafe in central Phnom Penh popular with wealthy expatriates. While options like goat cheese salad went down well with the international court officials, reports soon appeared that the local staff were complaining they would "die in two days" if they were not given something more to their taste. Then a local caterer took over, and offerings such as snail curry replaced the Western menu. The international staff complained of food poisoning, and one told the BBC that his stomach troubles only stopped when he started bringing a packed lunch to work. So now the Cambodian officials and their international counterparts lunch apart. They also do much of their work separately, and have very different views about how the trials should be conducted. That much became clear at the end of November, when a plenary session of judges that was called to approve the internal rules of the tribunal descended into farce. The participants could not even agree on who was eligible to vote, let alone the issues they were supposed to be deciding. Hopes of swift prosecutions promptly evaporated, replaced by fears for the future of the tribunal. There were many points of dispute, but the cause of the most rancour was the role of foreign defence lawyers. International officials have insisted that as foreign prosecutors and judges will be taking part, defendants must have the right to retain an overseas lawyer if they wish. The Cambodian Bar Association has, equally forcefully, made it clear that under local law only their members are allowed to represent clients in court. At the centre of the controversy is the British barrister who is the principal defender at the tribunal, Rupert Skilbeck. At 35, he is already a veteran of tribunals in Bosnia and Sierra Leone, and he accepts the recent turmoil as part of the job. "All the tribunals have had a difficult birth process. The tribunal in Sierra Leone I think took 12 months to agree their internal rules, and that was all with foreign judges. "In Bosnia, where there was a hybrid tribunal, probably the process closest to this one, the process of agreeing the legal process for the court took about two or three years," Mr Skilbeck said. "The balance between the foreigners and the locals has always been a problem in these tribunals." Mr Skilbeck seems an affable character, but critics within the courts claim that he has antagonised the very people with whom he needed to build bridges. There have also been suggestions that some of the other international officials have failed to understand that a less direct approach to working relationships is required in South East Asia. The split is so marked that referring to the "Cambodian side" and "the international side", as people both within and outside the tribunal do, seems entirely appropriate. Walking down the corridors of the tribunal's administration building, a visitor cannot help but notice the separate offices to the left and right for local and international staff. All the talk of sides makes it sound more like a football match than a judicial process, but such a comparison just raises a smile from Cambodian judge Mong Monichariya. He insists that relations are cordial, and that differences of opinion are inevitable when the aim is to produce an international-standard tribunal within the Cambodian judicial system. 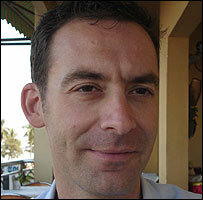 "The media publish information that the problems are caused by the Cambodian judges, but that is not true. We have many issues to resolve between the Cambodian judges and the international judges," he said. "Cambodian judges need time to understand the international legal system, and the international judges take time to understand the Cambodian legal system." Some observers, however, see the hand of the government behind the delays. 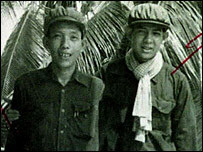 They point out that several senior members of the current administration were themselves once in the Khmer Rouge. While there is little chance of ministers being charged, they could be implicated by defendants or even called as witnesses. The Center For Social Development, a non-governmental organisation specialising in legal issues, has been monitoring events at the tribunal. Its executive director, Theary Seng, believes "there is no doubt that the government is pulling strings". "The trials will go ahead, but it may just be a minimum to appease the international side. 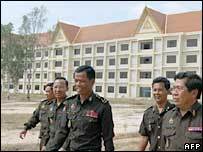 They have to delay so that all the senior Khmer Rouge people who could name names will die out," she said. For the millions of Cambodians waiting to see justice, that is a genuine concern. 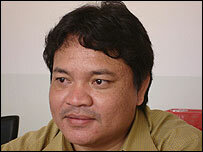 Last year Ta Mok, the only senior member of the Khmer Rouge in custody, died without delivering any kind of testimony. The other likely candidates for prosecution are also elderly, and some of them have been in ill health. Time is also running short for the tribunal itself. The three-year mandate began last July, and further delays would have a serious impact on the ability of the legal officials to complete their work. Perhaps with that in mind, both sides are making conciliatory noises. They agree that significant progress has been made on resolving differences, and say that meetings in March should iron out the remaining concerns. After all the setbacks, optimism will always be accompanied by a dose of scepticism. There is, however, one concrete sign that international relations at the tribunal may be warming up: The catering service is, once again, up for tender.